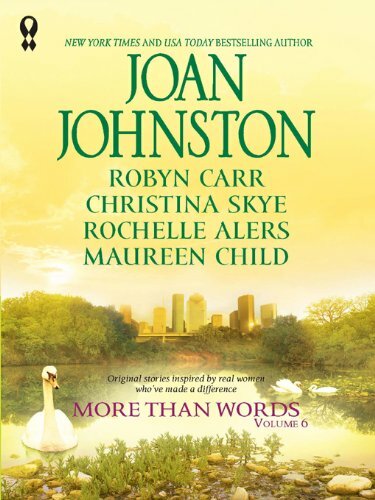 Presenting…the sixth annual More Than Words anthology. Little by little, one person at a time, we can make our world a better place. The five dedicated women selected as this year’s recipients of Harlequin’s More Than Words award have done just that, by discovering a seed of compassion, and nurturing it to effect real change in their communities. To celebrate their accomplishments, five bestselling authors have honored the winners by writing short stories inspired by these real-life heroines. Includes Sheltering Hearts by Robyn Carr, Almost Lost by Joan Johnston, Safely Home by Christina Skye, No Limits by Rochelle Alers and The Princess Shoes by Maureen Child. Harlequin hopes More Than Words inspires you to look into your heart and find the heroine who lives within. Proceeds from the sale of this book will be reinvested into the Harlequin More Than Words program to support the causes that are of concern to women.